Do your guests love kittens or puppies? Do they like bouncing or sliding? 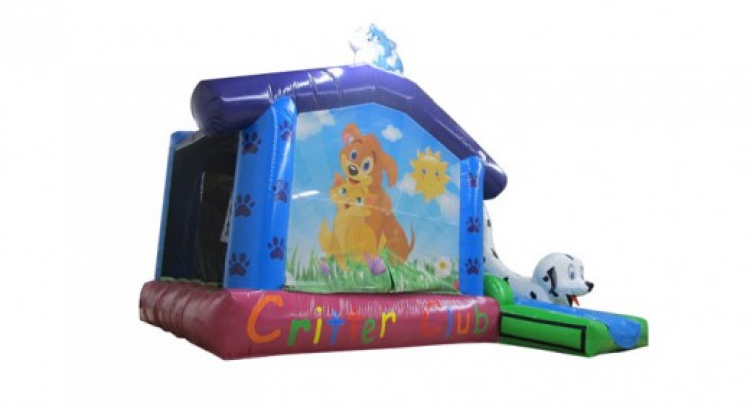 No need to choose, because this fun combo unit featuring all kinds of cuddly critters in a bounce house and slide in one. The bounce house, especially designed for kids ages 2 to 7, is mesh on two sides allowing guests to view all the bouncing fun. The two non-mesh sides of the bounce house are decorated with fun images of puppies and kittens playing, and there are cats on the roof, too! The big green and blue slide features a friendly black and white spotted puppy along the side. In addition to all of these fun features, this combination unit was designed with safety and durability in mind and constructed with only the highest quality 18 oz. "lead free" materials. Price: $229.00 per 7 / hrs. Price: $229.00 per 3 / hrs. Price: $229.00 per 4 / hrs.